An outlook on the Chinese automation industry in 2019. Georg Stieler quoted by Germany's leading business daily on the state-inflated bubble in China's domestic robotics industry. 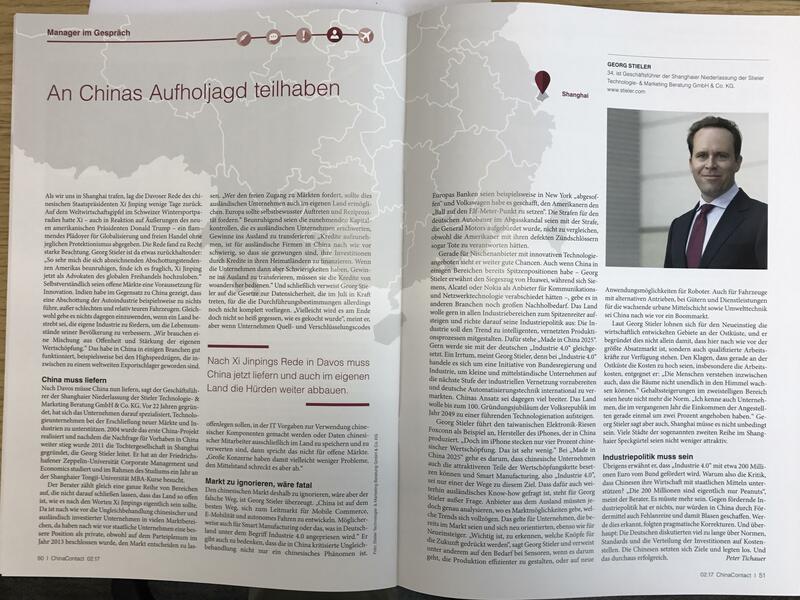 Die Zeitschrift Computer & Automation berichtet umfangreich über unsere neue Studie "Industrial Automation in China". MaschinenMarkt über unsere neue Studie "Industrial Automation in China". Joachim Stieler on the future challenges for manufacturers of hydraulic and electronic components in mobile working machines (only in German). Automatisierung in China: Roboter und Maschinen übernehmen im Reich der Mitte einfache Jobs. Das verändert das Land. Deutsche Maschinenbauer profitieren davon, erhalten aber neue gefährliche Konkurrenten. Interview mit Joachim Stieler zur Professionalisierung chinesischer Werkzeugmaschinenhersteller und den Folgen für die hiesige Industrie. China has become the world’s largest manufacturing base for mobile working machines by 2010. Despite the crucial role of know-how intensive technologies, such as fluid power, power transmission and motion control, the country still lacks a strong base of domestic component suppliers in these segments. However, the Chinese government as well as leading machine manufacturers are coming up with strategies to change this situation.